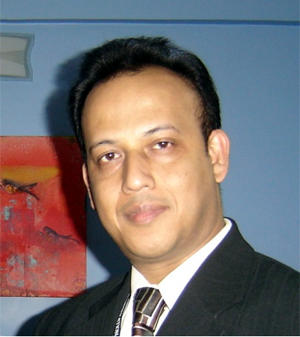 Goutam was born in 1968, Kolkata, India. A Science graduate from Kolkata University, ICWA (Inter) with a post-graduation in Business Administration, he had a passion for painting since his childhood but never had the chance of getting into an Art institution to hone his skills. He continued painting as a hobby along with his day’s job which was 11 years with Media & 8 years with real estate. In 1998 his job migrated him to Bangalore where he ultimately settled down with his family. He has a 5 years old little daughter, Aarushi. Vocationally, he works with Colliers International (an MNC Property Consulting Firm) as a Director for the last 3 years. Destiny connected Goutam with Murali Cheeroth, an MFA from Shantiniketan, a well known artist in the art fraternity. Through him, Goutam was introduced into the world of Art. He started studying the works of the Impressionist masters like Renoir, Monet, Degas, Pissarro, & the contemporaries like Murali, TV Santosh, Raza, Padamsee, Arekel, Husain, Samir Mandal, Bose etc. Murali taught him almost all the medium of Art, among which Goutam connected with the water color the most. Spirituality being the key motivation, Goutam finds human as the best subject to work on. Capturing different expressions of human face & putting their untold/ unasked question on the canvas with the brush is an irresistible addiction. Goutam has already done one solo exhibition in Cochin in the year 2005. Over the years he has piled up a stock for further 3/4 exhibition. More of Goutam's paintings can be viewed on his web gallery at www.artmajeur.com/goutam. ???? ?????? ???? ??????? ?? ??????? ??????????? ???? ?????? ?, ????????? ??? ???? ??? ????? ???? ????? ??? ????? ???? ???? ???? ????? Impressive, I like all, the little prophet caught my eye immediately.